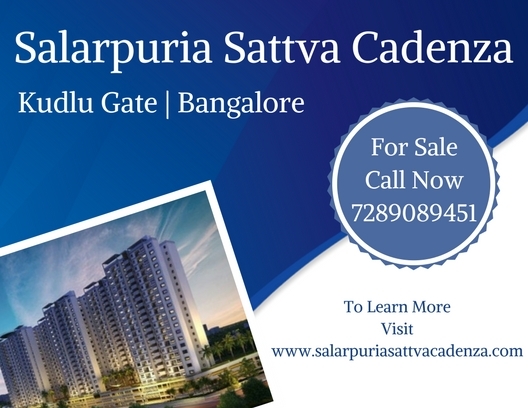 Salarpuria Sattva Cadenza Bangalore: Take living to the next level! An enchanting winding drive through Zen themed landscaped green areas and waterbodies leads you to the exclusive residential area of Salarpuria Sattva Cadenza. The spectacular and aesthetic exterior façade, chic clubhouse and upscale campus area leaves one spell bound. Spread across 5.8 acres this project has high-rise buildings of 22 floors each which in turn contain a total of 513 apartments. The spacious 1, 2, 2.5 and 3 BHK apartments have sizes ranging between 714 sq. ft. to 1850 sq. ft. Plush ameneties provided to give one a privileged lifestyle arean indoor clubhouse, swimming pool, gymnasium with sauna/steam/Jacuzzi,yoga deck, reading room, kids’ pool, a podium level garden, fun seating areas on tree courtsand interesting walkways. Extensive sports facilities include a skating zone, courts for basketball/ squash/badminton, TT & billiard rooms and a special golf simulator. Rs. 42.05 lakhs to 1.08 crores is the reasonable price reflected in the Salarpuria Sattva Cadenza price list. Over the last decade, Sattva Group has been an activeand key player for the real estate growth in the Silicon Valley of India Bangalore. It has developed numerous innovative and aesthetic residential developments which have become landmark projects with ultra-modern features. 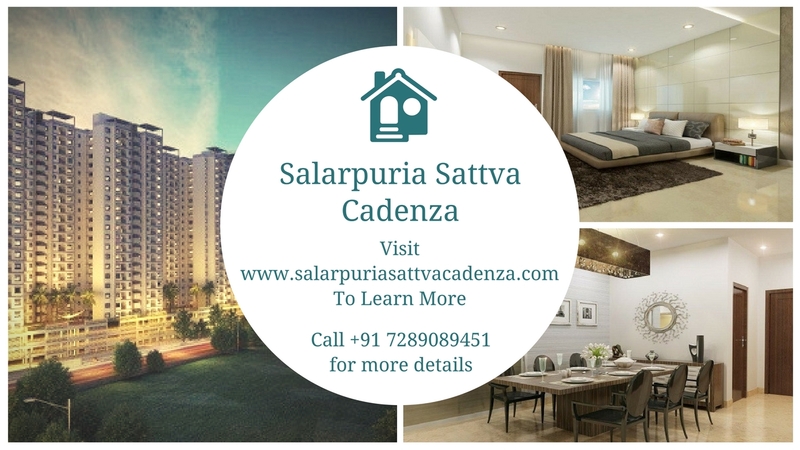 Located on Hosur Main Road at Kudlu Junction, Salarpuria Sattva Cadenza Bangalore has easy access to the other important destinations through the Expressway, the Ring Road and the NICE Road. Very close to the Electronic City, it is just 4 kilometers from the Silk Board Junction respectively.In close proximity are AMR Tech Park and numerous IT companies like Wipro&Infosys. Important areas like Koramangala, HSR layout and Sarjapur Road are also close by. Reputed schools,hotels, malls, andhospitals areas close by from Salarpuria Sattva Cadenza Kudlu Gate. It would be wise to avail this opportunity to take living to the next level! Close to AMR Tech Park and IT companies like Wipro, Infosys etc. 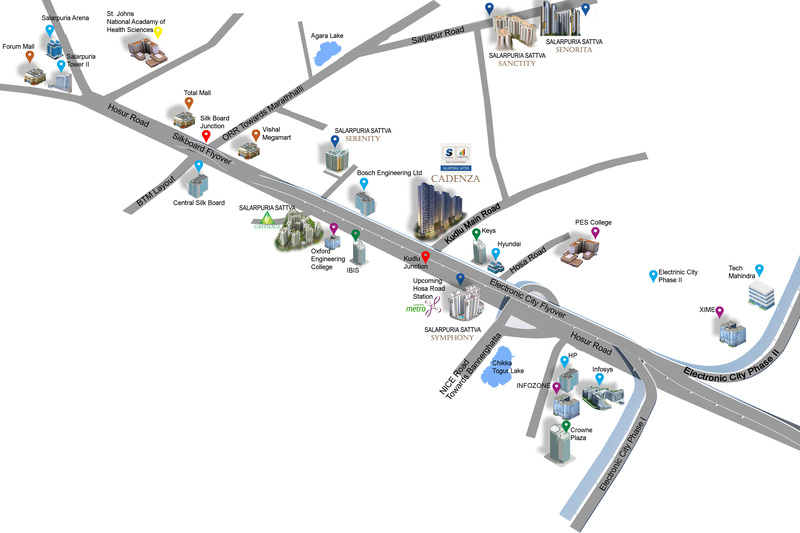 Close to Koramangala, HSR layout, Sarjapur Road etc. Easy access to malls, shopping complexes, schools, hospitals.